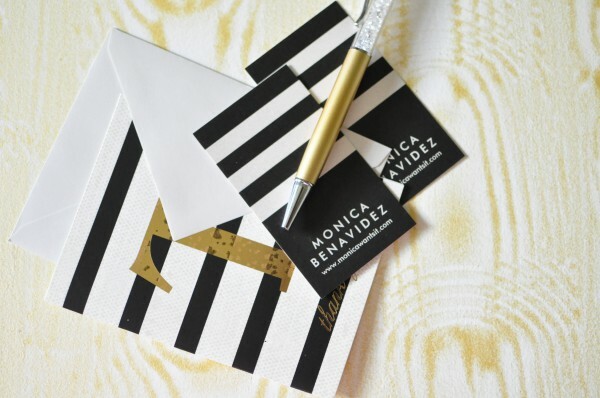 Before we get started, have you checked out my black, white and gold office reveal? Pretty please do. I promise this post will be here while you check it out. 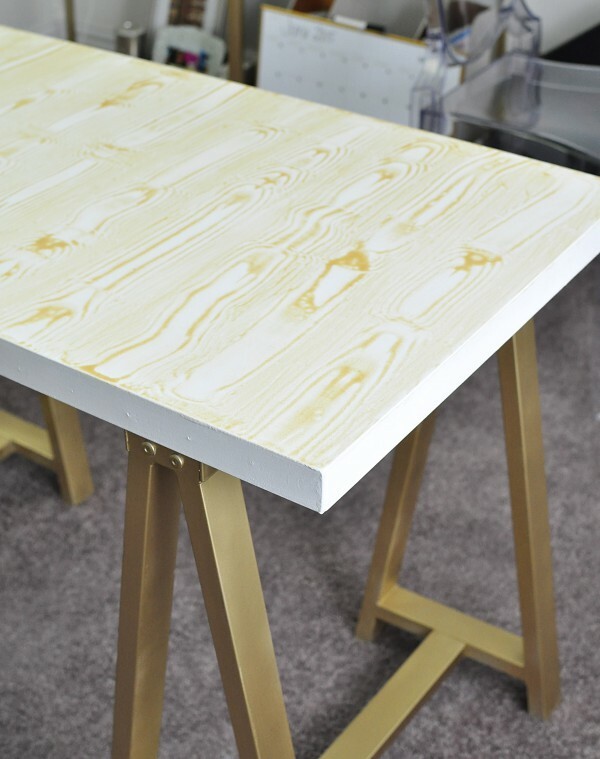 Last year I worked on my gold faux bois sawhorse desk. And then I did two things that screwed it up…so I had to redo it again. So, I’ve done this twice now. My idea isn’t original– I got it from the fab Martha Stewart. There’s a video and full tutorial via this link. So, use that tutorial. What my post will have is information on how now to screw it up because I like to keep it real. I have DIY fails, too. 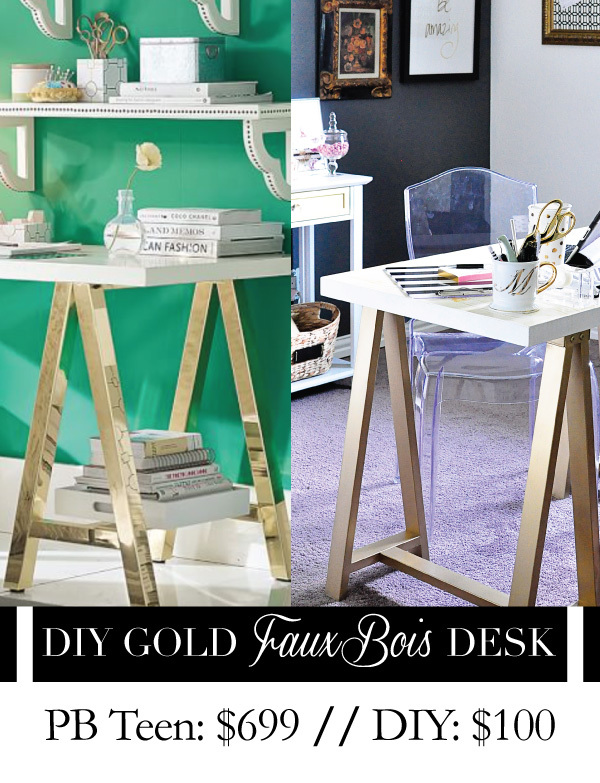 The inspiration for this desk came from PB Teen. 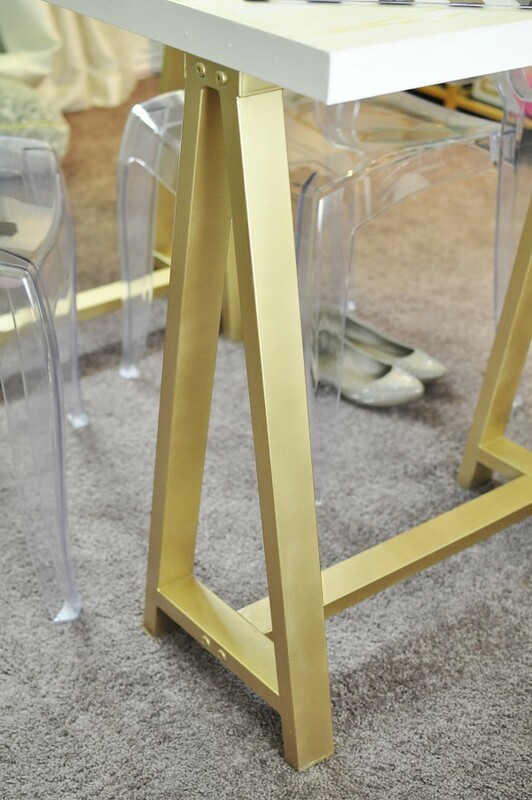 This desk had me SWOONING! However, there was, and is, no way I was paying that much. Ever. Especially because my tastes change quicker than a Britney Spears boyfriend. 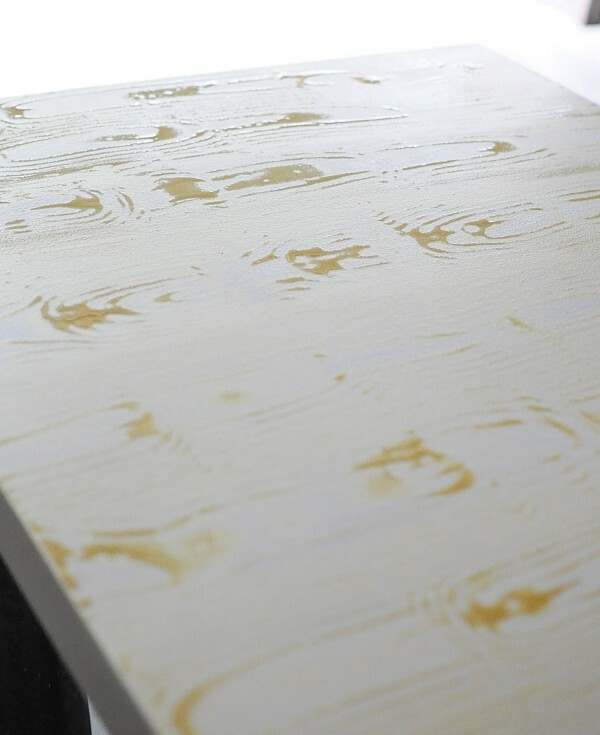 I’ll love faux bois this year, and in 2016 want everything damask again. I had this old desk back from our apartment days. Daniel used it while he was taking online classes. I believe we paid a whole $70 for it at Office Depot, and surprisingly it’s held up well to painting and moving, etc. I painted the “sawhorses” with my trusty gold spray paint from True Value. It’s seriously THE BEST gold spray paint. Unfortunately, there isn’t any spray paint that can give the shiny finish of the PB Teen desk, but I’m willing to make sacrifices. Also, the gold spray paint doesn’t work well with metal primer, so just use regular primer, not the one for metal. Do as I say, not as I do. I did seal the sawhorses with poly (this one to be exact) so that it’d hold up to daily use. Total this project cost me about $30 of supplies (spray paint, wood-grain rocker, acrylic paint, poly), I had high gloss paint on hand, but if I include the original cost of the desk it’d be about $100. That’s a $600 savings from the PB Teen version. 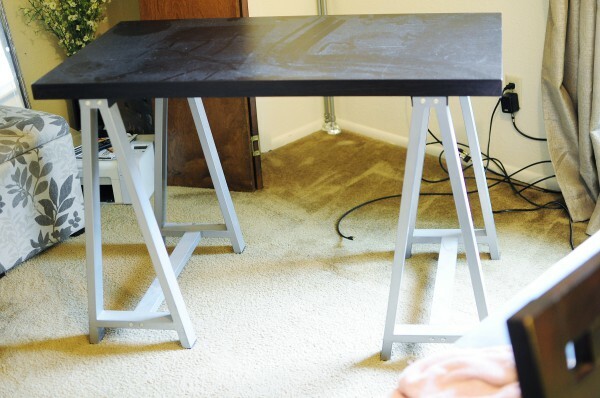 The laminate desktop got painted with Zinsser primer and two coats of high gloss white paint. Finally, it was time for the faux bois treatment. -The paint mixture will be watery, uncomfortably so, but it all does workout and the pigment is still as strong. I promise. I was afraid the gold on my desk would be faint, but it truly does stand out. -Inevitably you’ll end up with spots that end up taking longer to dry (see below). DO NOT smudge or touch them. I did on my first run at this and ended up with a finger print in the finish. I PINKY SWEAR it does dry. Let it go. -Don’t overthink it. Take the wood-grain rocker (I bought this one) and rock it. Vary your movements from one column to another. If you truly hate the pattern, use a paint brush to “erase” it while the paint is still wet and try again. -After it’s done drying for about 48 hours, apply poly. I used this one, and it’s held up really well. I’m totes rough with my desk. I leave water bottles and soda cans rings, and it just wipes off. To be honest, I probably did about three coats of poly on the desk because I didn’t want to have to do this a THIRD time, y’all. I love my desk, and I’d like to think it looks fancy schmancy. 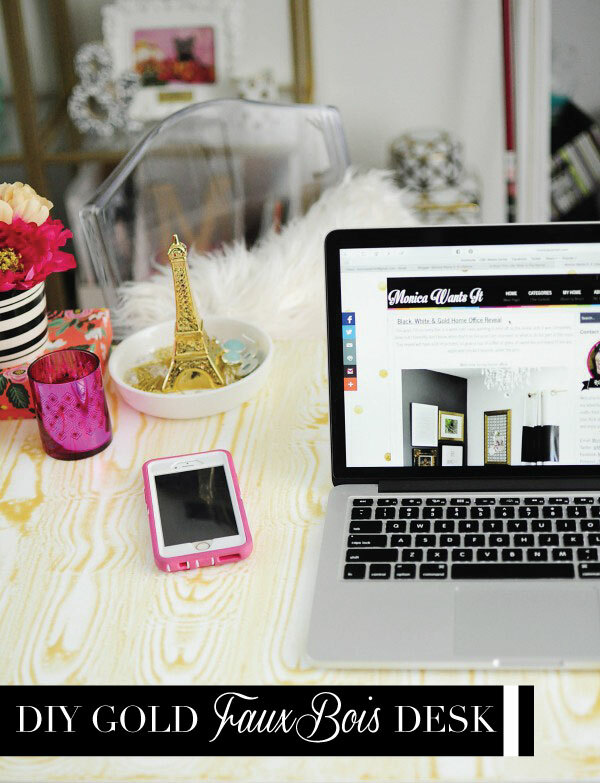 I’m happy every time I sit here and blog or work on a craft. Beautiful spaces are productive spaces, right? I hope you all had a fabulous weekend- did you do anything fun? Thanks so much, Elba! You're so kind. xo! Amy, you're so kind! Comments like yours make my day. I try to be honest because I dislike when someone makes something look so easy and I find it challenging. I figure that readers probably appreciate when bloggers are honest, so that's always been my mantra. Glad you find it helpful. 🙂 xoxo!